The Tone Pacer Pro The Tone Pacer Pro application is the professional version of the popular Tone Pacer APP. In addition to the exercise coaching applications found in the original Tone Pacer application, the Tone Pacer Pro, includes features designed for use by healthcare professionals, researchers, and people skilled in the application of functional neurology methods. The Pro version, allows the user to manually set frequencies for tone 1 and tone 2 via a pop-up the keypad which allows the user infinite control on the auditory stimulation output for the application. This feature is known as the custom frequency feature. In addition the Pro version features an alternating mode which cycles between ton1 and tone 2. This feature is a compliment to the reciprocating audio stimulation mode found on the original Tone Pacer program. 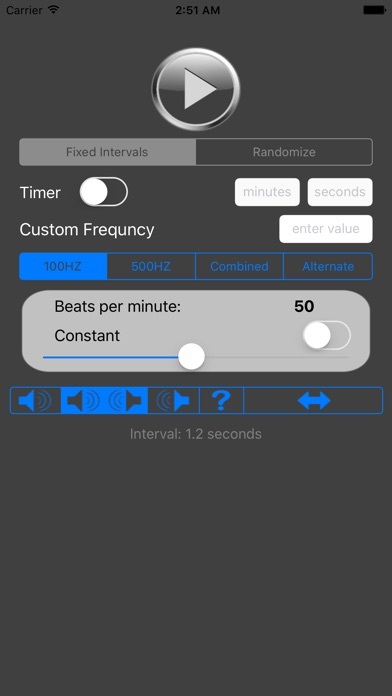 The Pro Version allows for the control of beeps per minute, but has the added feature of continuous tone output. This has potential applications for binaural beat protocols for the entrainment of brain rhythms and may have application for cerebellar cortex stimulation. The Pro Version due to its flexibility also lends itself for notch-like treatment protocols that have been shown to attenuate tinnitus and Stochastic Vestibular Stimulation. The Pro version was design to meet the needs of professionals seeking an application for the generation of acoustical auditory stimulus.